American portal “Huffingtonpost” writes that the fresco of Christ’s Crucifixion from 1350 Visoki Decani is proof of the existence of aliens. Specifically, the mural can be seen two strange objects from left and right side of Jesus. Conspiracy theories claim that these extraordinary images actually spaceships, and thereby seek to prove extraterrestrial life, but a professor at New York University, believes that this is not true. According to the expert art history, these unusual and strange details are actually celestial bodies, writes “Huffington post”. However these details seem strange to the human eye, the fresco seen something quite normal, it is the moon and the sun, said Italian professor from the Department of Art History at New York University. The image of Karl Krivelij “Annunciation with Saint. Emidij” from 1486, and the image of “little St. John the Baptist “there are also strange undecided elements. Following the conclusion of the Italian expert, none of these images shows some UFO facilities. The strongest evidence for visiting aliens on our planet several centuries old is in Serbia or Kosovo the monastry High Decani, claims Swiss journalist Erich Von Daniken. Also Erich Von Daniken who is a Swiss journalist, writer, artist and mysteorologyst with his deeds claims that aliens have visited our planet in the Middle Ages. 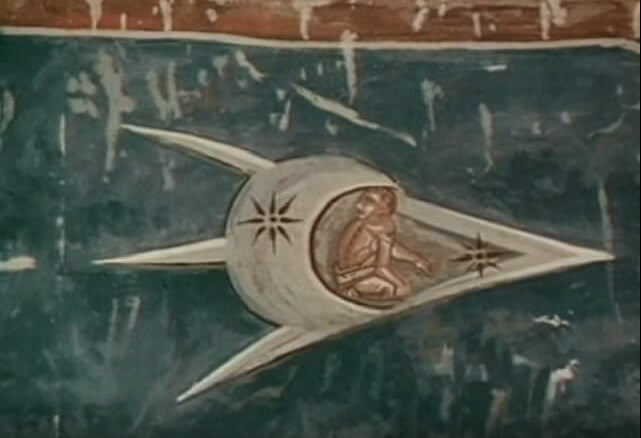 According to him this is mirrored in the fresco Crucifixion in “Visoki Decani” Monastery in Kosovo and Metohija. It is a fascinating fresco and I many years ago suggest. It is simply amazing that many scientists talk about the theory of the existence of aliens, and no one mentions najkonkretniot proof of which is located in the Serbian monastery Visoki Decani. This monastery is located in Kosovo and is under constant threat from the Albanian vandals and extremists, because the international community should be possible to protect, says Daniken.